My husband and I love to cook, well the little mister too, and we are always on the looking for kitchen tools that will help us achieve professional results easier. When I heard about the Cookie Thing I knew it would work, we had seen this idea before but never an actual tool until now. 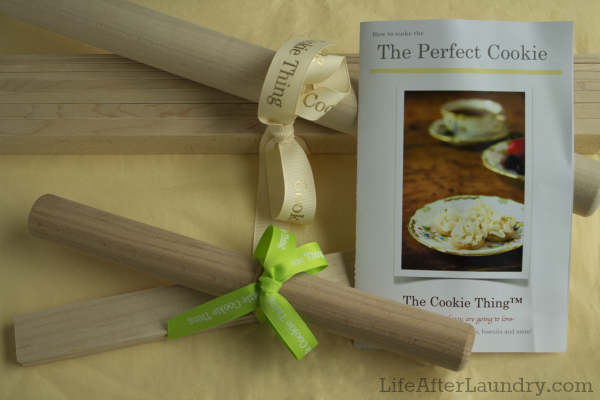 TheCookie Thing is a measuring device that helps you accurately roll our dough to the desired thickness. It is made of solid maple wood, and comes with rollers and 4 sets of “thickness” boards, measuring 1/8, 1/4, 3/8 and 1/2 of an inch. I don’t know how many times I have seen a recipe that called for dough to be rolled into a certain thickness. It always proves to be more difficult than you would think. You should see me holding a ruler up to the dough checking to find it’s slightly too big only, then roll it one more time and find it is less than what I need. Then having one side right it doesn’t mean that it’s consistent all the way through. Can you tell my frustration with this process? Thankfully, I will never have it again. Not only are you able to get even thickness- perfectly sized cookies, but it makes my life a little easier with how much mess it helps me avoid. For example, there is no need for extra flour. 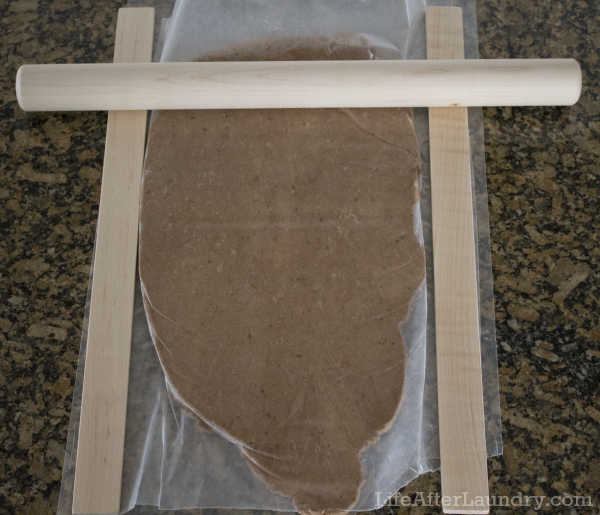 You lay your dough in between wax paper, and there is no sticking or tough clean up. I don’t know about you, but I cannot open the flour container with out it being all over the kitchen. For its kitchen debut we decided to make Mint Chocolate Cookies. Well, actually there was no “we” about it, it was all me. My husband isn’t a big fan, but to me there is just something about winter weather and holidays that requires mint. But, making a cookie that my husband wasn’t a fan of, meant I was on my own coming up with the recipe. Which had me a little concerned at first because I am definitely not the baker in this family. I spent a little while trying to come up with my recipe before finally heading to the stand mixer. It was important to me that the cookie be minty without being overwhelming. I contemplated using mint extract but then made the split minute decision in the grocery isle to use Andes Mint Baking Chips instead, and I was very pleased with the results. The chocolate- mint balance was perfect, and I don’t have mint extract sitting in my cabinet collecting dust. You can find the recipe below for my Mint Chocolate Cookies, but here is a little about my experience with the Cookie Thing. 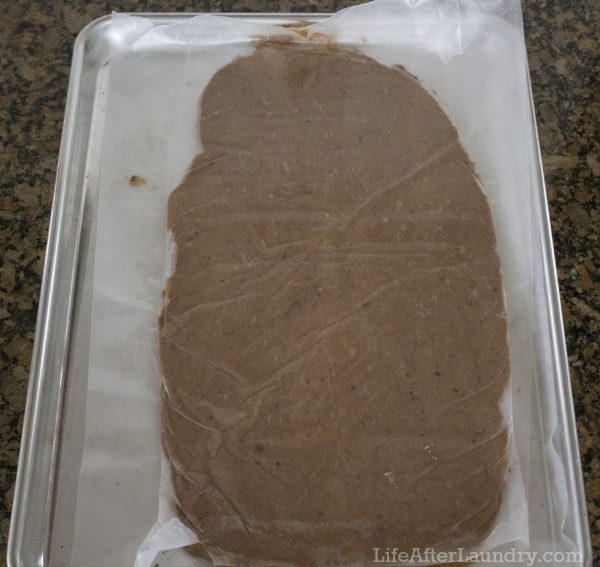 After mixing up all of the ingredients I laid the dough onto wax paper. Then, I laid another sheet of wax paper on top, and placed the 1/4 in guides on the side. See no extra flour! 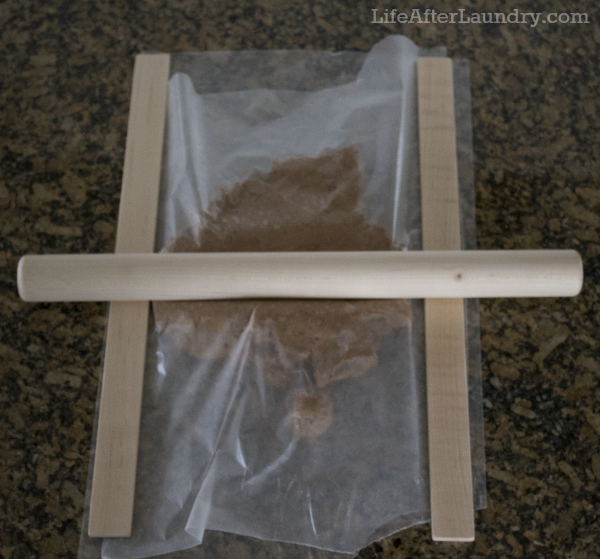 Starting in the middle of the dough, I pressed down firmly with the roller, and rolled it out in each direction. I originally placed all the dough on to the wax paper, but I think it would work out better next time if I divide the dough in half before rolling out. 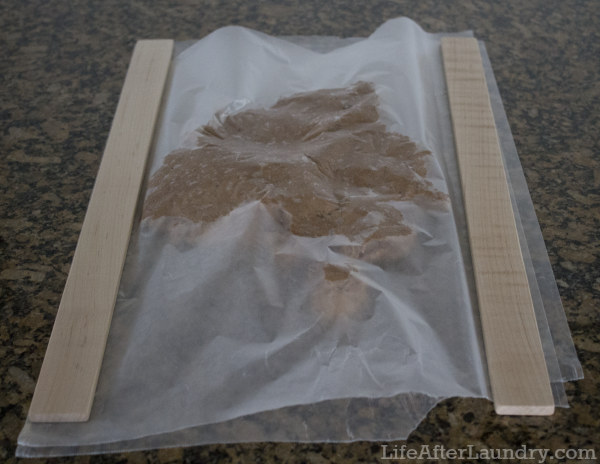 When I put all the dough on at one time I had a problem with some coming out the ends of the wax paper. After, the dough was rolled out I placed it on a sheet pan and refrigerated it for 1 hour. Once the dough has chilled, remove the top layer of wax paper and lay it on to parchment paper before removing the other layer of wax paper. I found using parchment paper made it easier to cut out the shapes. I decided to cut out circles for my batch, but you could use any shape. The dough will spread out a little, so keep that in mind when choosing a cookie cutter. 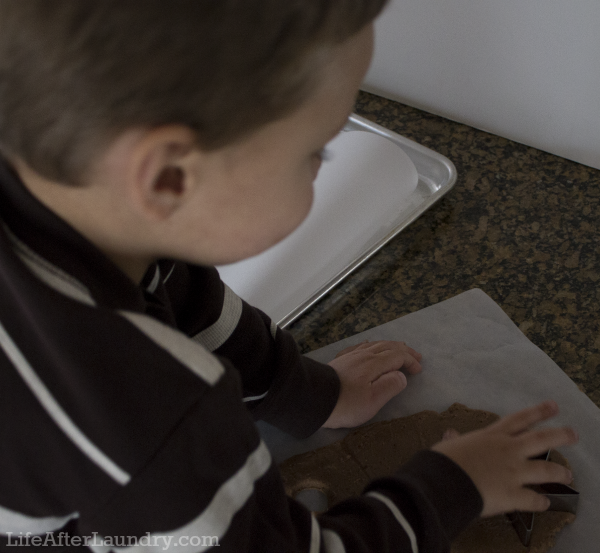 After, getting all that I could out of the dough, I gave the leftovers to my son to try out the Little CookieThing on. It has a smaller roller and 1/4 in guides, which is the most common size anyway. He was so excited to help with the cookies and loved that he had his own tools. Of course, circles were too boring for him so he cut out different shapes, stars and gingerbread men. 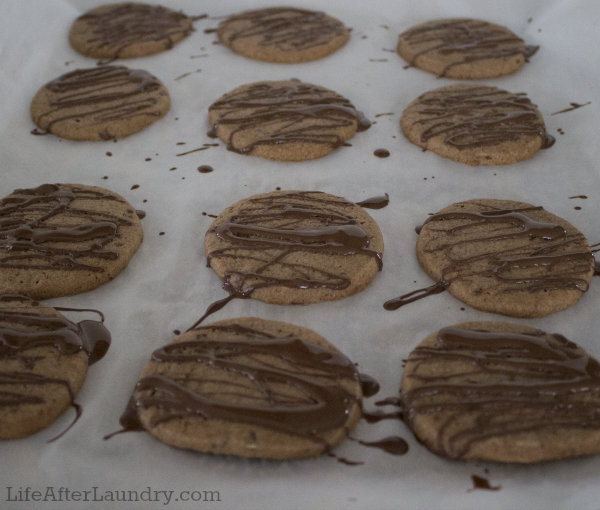 Once the cookies were baked we used a fork and drizzled mint chocolate all over them. I could barely wait till they cooled. I was so relieved when they turned out great. Thankfully, it wasn’t just me that loved them, everyone did. Even my non- mint loving husband enjoyed them. I know that The Cookie Thing had a big hand in my success. It was so quick and easy to get the perfect thickness of dough which allowed them to bake even! There was no extra flour mess to dry out the cookies or leave it’s mark on my kitchen, so clean up was a breeze. Which makes a happy momma, and all I had to do was sit back and enjoy my cookies with a glass of milk. Mix in the egg, vanilla, cocoa powder, and 1/4 cup melted and cooled baking chips. Add in flour, baking powder, and salt until everything is incorporated. 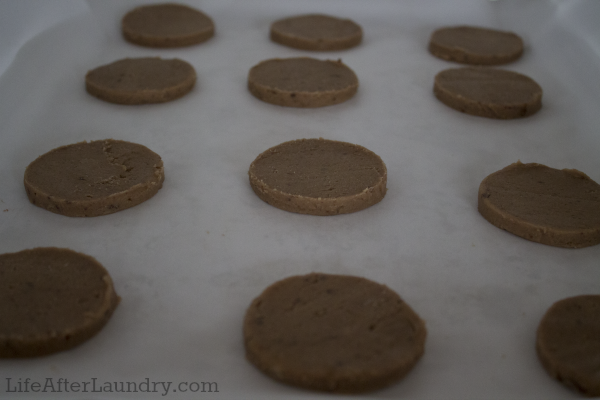 Roll out cookies between two sheets of wax paper and refrigerate for at least an hour or up to overnight. Preheat oven to 400 degrees when ready to bake. Cut out desired shapes. Cookies will spread slightly so leave room. Melt a cup of baking chips to drizzle on top of cookies. Allow to cool until the chocolate drizzle has hardened. I saw one person who was talking about trying to make tortillas with the Cookie Thing, which I thought was a great idea. It has me dreaming up all kinds of new possibilities for this little tool. I know it will be wonderful to use for rolling out pie crust. I have to say I’m most looking forward to testing it out with biscuits. I need all the help I can get and if I don’t finally master them, someone is going to come in take my “southern lady” card away. With Christmas coming this would make the perfect gift, and right now you can enter the code BAKER for 25%. The code is case sensitive, and you need to wait until everything is in your cart to apply the code to save on your entire purchase. What a neat little tool, and your cookies came out looking great. Rolling tortillas and pie crusts with the Cookie Thing sounds like an awesome idea. I hope it works! Thank you, Holly. I will let you know when I try it. This looks like a great tool and the cookie recipe sounds yummy. Thank you for sharing. That does sound like a perfect afternoon! We are having a Lexington kind of day here. Windy and snow. It isn’t sticking, but it is stinking cold. I could use that Starbucks about now. well that cut off my sentence. I was saying this WOULD make a great gift. I may have to get one for my DIL. Mint and chocolate?? Umm.yeah!! Sounds delicious! Amber.M recently posted…Guide guide for men. I’m so glad I wasn’t the only one with this problem. I won’t make cookies any other way now. I’ve always wondered how these things work! Sounds like a great tool to have in the kitchen. I too will be doing some cookie baking in the upcoming weeks! It really was such a big help! I am making cookies over the weekend and I’m thinking I could use this! cookies look great! Thanks, Nancy. I would never want to make cookies any other way now. All linked up. Thanks Kathleen. Oh my!! Those cookies look perfect–and delicious! Why can’t we live closer?! I would invade your kitchen every single day LOL. My little sister is all about baking… I know she would love those tools. That would be perfect to sit and enjoy these cookies and talk! Columba Lisa Smith recently posted…Why Doesn’t God Answer My Prayers the Way I Want? You are too nice. I’m not really, the Cookie Thing helped me out a lot. My husband is not a mint fan either but I love it around the holidays! 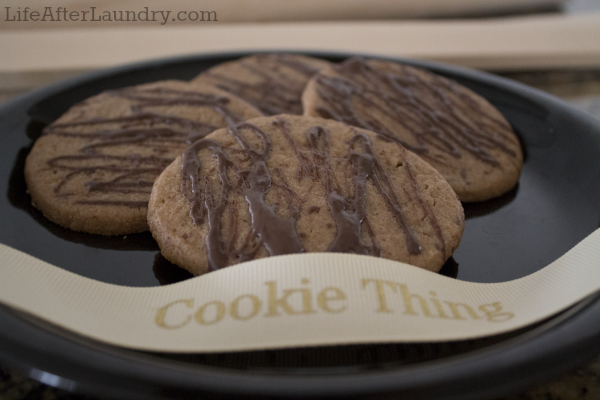 I totally need to invest in these because I am horrible at judging the thickness of my cookies. Ok, it totally makes me feel better that you aren’t good at that either. Cause you are a great baker. It was crazy how much simpler it was with the Cookie Thing. Thank you so much, Susan. I will have to try that with the biscuits. WHOA this is AWESOME!!! Need one! If you decide to get one, don’t forget to use the coupon code. Wow! Looks like a great baking tool my Mom and I can use this Christmas! It really was such a help in the kitchen and could definitely come in handy this time of year. It definitely makes things easier Allison! I LOVE mint chocolate cookies! They are seriously the best. Yum yum yum, now I want some! I know. I’m thinking about making another batch tonight. I needed this when I was growing up. 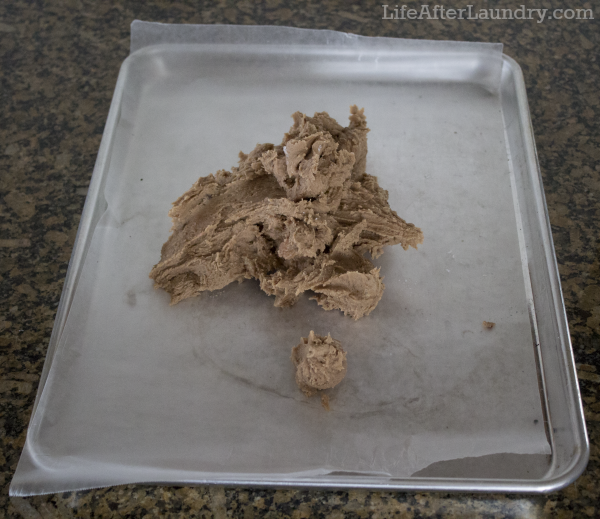 Rolling out cookies was such a stressful experience….I’m just a lopsided kind of girl. 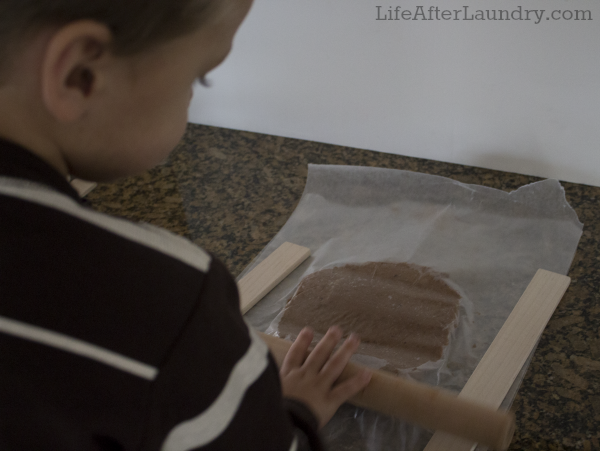 This is really a great idea, my kids never know how much they can roll on a dough as much for a pie or any thing that has to be rolled on. Thank for the tip! And your recipe really looks good too! What a great tool! I work a lot with gluten-free dough. It’s very sticky, and has to be rolled out between sheets of plastic wrap. I wonder how this would work. Looks promising!